The Finance Commission of Bharat was established on 22nd November, 1951 under Article 280 of Bharat’s Constitution by the President of Bharat. It was formed to describe the financial relations between the centre and the state. These recommendations have progressively increased the share of the state governments in the proceeds of the taxes over a period of time. They also increased gradually the amount of grants-in-aids to be given to the States. The 14th finance commission has increased the share of the states from 32 % to 42% from the divisible pool of central fund. As a result the states now enjoy considerable degree of financial autonomy to run the government in their respective states. However, certain states have been complaining that the share in the revenues they get from the central pool is much lesser compared to the contribution made by the state to the central pool. In a federal system this is bound to happen when we have states where the economic development is different from one state to another. Nevertheless the sharing of the revenues from the central pool must reflect an equitable distribution that not only allocates more funds to the underdeveloped states but should also be an incentive to encourage the developing/ developed states. If one looks at the broad terms of reference to the 15th finance commission (covering the period April, 2020 to March, 2025) they contain the following guidelines. Replacement level is the amount of fertility needed to keep the population the same level from generation to generation. It refers to the total fertility rate that will result in a stable population without it increasing or decreasing. Replacement rates can change over time based on the major factors like- mortality rate, immigration rate and emigration rate. Therefore, the population growth or decline in a state will depend not only on the birth and death rates but also on the inflow and out flow of the people in the state to the other parts of the country and abroad, and the gender ratio of births. States having higher replacement rate – Bihar, UP, Madhya Pradesh, Rajasthan, Jharkhand, Chattisgarh, Assam, Gujarat , Haryana and Odisha. 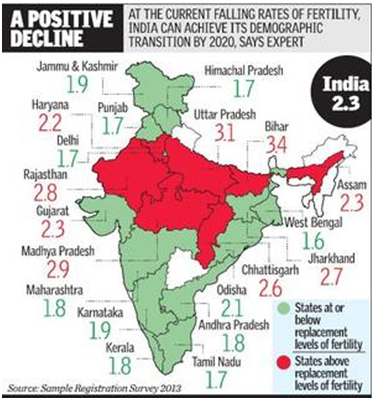 States having lower replacement rate – West Bengal, Tamil Nadu, Himachal Pradesh, Delhi, Punjab, Maharashtra, Kerala, Andhra Pradesh, Karnataka, Jammu & Kashmir. Population is as per 1971 census. Demographic change is change in the population with 2011 census as base year as per 14th finance commission’s recommendations. Income distance is computed by calculating difference between 3 year average GSDP (Gross State Domestic Product) for each state with respect to state with highest per capita GSDP. Forest cover to take into account the opportunity cost in terms of area not available for other economic activities. Area has a floor limit of 2% for smaller states in deciding horizontal devolution. A review of the performance of the 11 states, which have been accorded special category, on select parameters like GSDP, infant mortality rate, poverty, unemployment and literacy indicates the following rankings which are not very encouraging. % of people below the poverty line as on 16th September, 2016. (Source: “Report on Fifth Annual Employment-Unemployment Survey (2015-16)” (PDF). Ministry of Labour and Employment. p. 120.). The special category state status does not contain any specific targets/mile stones to be achieved through the funding assistance provided under the special category, nor any time lines for the same. This is a fundamental flaw and it has to be rectified. On the other hand, the recently formed Andhra Pradesh (post bifurcation of the state into Telangana and Andhra Pradesh) does not have a capital city. The state also does not have prominent educational and other institutions and seven districts out of the total thirteen districts in the state are backward regions. In the recent past, the AP State government has started complaining that the centre is not fulfilling its obligations as envisaged in the AP State Reorganisation Act, 2014, and is not meeting its financial commitments under the special package announced for the state by the centre on 8th September 2016 to assist the state in developing the capital city and create the required infrastructure. We are witnessing a peculiar situation where on one hand the centre’s financial assistance to 11 states classified as special category states is being continued indefinitely without linkage to any tangible outcomes, whereas on the other hand a state that is left with no capital of its own, no major educational institutions worth reckoning and half of the state is comprising backward areas, but the centre’s financial assistance is not matching its mandatory obligations under the specific act and the subsequent notification issued post bifurcation of the state under special package to ensure justice. Therefore, there is a need for the centre to address the above anomalies, remove the inconsistencies and evolve a consensual approach through dialogue with all the states by Niti Aayog, and give revised terms of reference to the proposed 15th finance commission so that equitable justice is done to the states wherein the performing states are suitably rewarded and at the same time the states that are lagging behind are given the required support to improve their performance and the indefinite financial support being given to special category states is put to an end in a time bound manner.